J.R.R. TOLKIEN (1892-1973) is one of the twentieth century's best-loved writers. His books, which include The Hobbit, The Lord of the Rings, and The Silmarillion, have been translated into more than thirty languages and have sold many millions of copies worldwide. At the end of the school year, I had to do an Author Project. I chose J.R.R. Tolkien because I adore the Lord of the Rings movies, but I had never read any of the books and I wanted to start the series and learn more about Tolkien himself. For the project, I had to do a short review of a biography on Tolkien, a critical review of one of his works, and a research paper on his life. I really enjoyed learning about Tolkien and how this amazing story came to be. So I revised my critical review of The Fellowship of the Ring into a more blog-friendly review and decided to share it here today! The Fellowship of the Ring, the first installment in J.R.R. Tolkien's Lord of the Rings trilogy, is a fantasy story that follows the life of Frodo Baggins on his journey to destroy a ring born of dark magic. Frodo's mission begins when his uncle Bilbo Baggins flees the Shire, home to many hobbits, leaving Frodo with the deadly ring. Anyone who wears the ring for an extended period of time will be invisible to most; but while doing so, the sanity of the ring wearer will slowly diminish, and their location will be exposed. 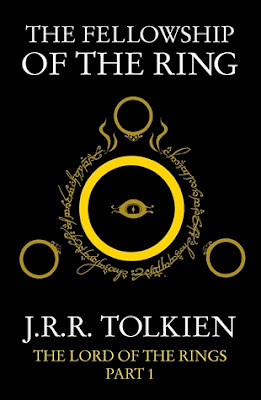 The plot of The Fellowship of the Ring is fast-paced, exciting, and easily keeps the reader interested in this unique fantasy world Tolkien has created. As Frodo and his comrades (Samwise Gamgee, Gandalf the Grey, Aragorn, Legolas, Boromir, Gimli, Merry Brandybuck, and Pippin Took) begin the quest to Mordor, they encounter creatures and challenges of all varieties, making this story an exciting expedition for the reader similar to the journey within the pages of The Fellowship of the Ring. "There were green trees with trunks of dark smoke: their leaves opened like a whole spring unfolding in a moment, and their shining branches dropped glowing flowers down upon the astonished hobbits, disappearing with a sweet scent just before they touched their upturned faces. There were fountains of butterflies that flew glittering into the trees ..."
The characters in The Fellowship of the Ring were both entertaining and charming; many of the characters -- in particular, hobbits Frodo Baggins and Samwise Gamgee -- steal the reader's heart with their witty humor and determination to do what is right. While this story contains many antagonists, Tolkien also gives the reader a plethora of lovable and relatable characters. The Fellowship of the Ring is a brilliantly developed story with an intriguing storyline, vibrant and descriptive writing, and endearing characters. It is no surprise that the Lord of the Rings trilogy has been loved by so many for such a long period of time, and it will undoubtedly continue to be loved for years to come. and most timid hobbit, waiting for some final and desperate danger to make it grow." Great review! I don't care for the stories myself (probably because I can't get into fantasy), but glad you enjoyed it! So you got an A, right? I hope so. Great job, hon I haven't even watched any of the movies all the way through. Aw, thank you so much, Ms. Christy! I just adore this series. I was never interested in the movies until my mom made me watch the first one and I was HOOKED lol. Awesome review, I love this author and series! Wonderful review, Mckenzie! I adore this series and The Hobbit. I remember reading it when I was younger. I do need to re-read it. And I agree with you on Tolkien's writing style. It always pulled me into his wildly imaginative world. Thank you so much, Ms. Magen! His writing is incredible; I just love everything about this series. Tolkien. I almost consider him a god. A literary god, that is! I have no words to explain what this author means to me..... I have several editions of The Lord of the Rings; that's how much I LOVE this book trilogy!!!! I only wish I could have had the honor of meeting him in person..... Oh, to have been one of his students at Oxford!! You've really done justice to the beauty of this novel, too! Yes, it's definitely enthralling, and Tolkien's writing is exquisite in its descriptive power, as well. I LOVE the two quotes you've shared here! In addition to his prose, of course, we readers have all those wonderful characters! In short, you've made me want to re-read this novel, as well as the sequels! And I need to see the movies, too. Unlike you, I read the books first -- years ago. This makes me so happy! I adored this trilogy and it will forever be a favorite of mine so I'm really glad you enjoyed it too. Strider is my favorite character cause I loooves him. I so cannot wait for you to read the rest of the series. Lovely review! And right now, I'm reading a biography about the Inklings, a group of writers that J.R.R. Tolkien belonged to for over 30 years, in Oxford, England. One member of the Inklings was C.S. Lewis, who wrote the Narnia series. Now, because of your amazing review, I must go re-read the Fellowship again. Hugs and hugs and even more hugs!